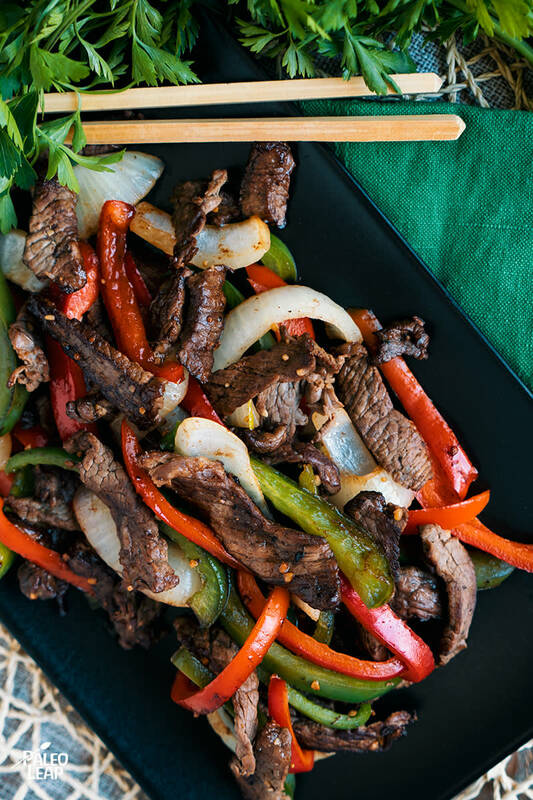 Steak and pepper with onions, ah, the good old flavors of yesteryear keep returning, reinventing themselves and making a comeback. Enter the coconut aminos and the meal is once again fit for a Paleo king, queen, or humble cave person. In reality this dish is fit for everybody, young and old, so long as you have the jaw capacity for chewing a top quality, amazingly tasty sirloin steak. Once you fulfill that requirement, owning a cast iron or stainless steel skillet and a source of fire to cook too, then dinner shall be on its way. Choosing the right kind of steak makes or breaks the effort you put into preparing and cooking a meal. If you are going for speed, and in this meal you are, you’ll want to choose (and slice) the proper cut of meat, and in a hurry! Sirloin steaks are fairly inexpensive, and while not nearly as tender as some other cuts (porterhouse, strip steaks, filets) they are far more tender than steaks cut from the round – you will want to stew those for the best beef experience. When all is said and done, it is all about how thinly you slice the steak, and for reasons that do not need to be said, never overcook the steak and let it dry out. Never. You may want to have an extra red bell pepper on hand for snacking while you are preparing the meal – it is hard to chop, chop, chop and not sample a bite… If you have more extra peppers on hand, you can always stuff them for dinner tomorrow night. In a bowl combine the coconut aminos, garlic, ginger, vinegar, honey, and season to taste. Melt half of the coconut oil in a pan over high heat. Generously season the steak to taste and quickly brown in the pan for 1 to 2 minutes, and set aside. Lower heat to medium and add remaining coconut oil. Cook the onion and bell pepper, 2 to 3 minutes or until soft. Bring the steak back to the pan, pour in the garlic-ginger sauce over everything and stir well. Continue cooking another 8 to 10 minutes, or until you reach the desired doneness.